Every week on Monday morning, the Council and our invited guests weigh in at the Watcher’s Forum with short takes on a major issue of the day, the culture or daily living. This week’s question: Will The Iran Deal Pass Congress? Don Surber: It better or — RACIST! The Independent Sentinel: Don’t forget, we don’t want to embarrass Kerry in front of the Ayatollah! That would be our worst nightmare. The Glittering Eye: It probably won’t pass the House. Whether it passes the Senate will depend on what Chuck Schumer does. It Schumer supports it, it could pass the Senate. If he votes against it, not only is it possible that it won’t pass the Senate it’s possible it could fail in both houses by veto-proof majorities. JoshuaPundit: It will probably not pass congress initially. Certain Democrats will be given permission to vote ‘no’ for political reasons, so they can say they did later. Chuck Schumer will likely be one of them. The president will veto it and there will not be enough votes to override it. One would expect a congress who was openly and deliberately lied to about the components of the ‘deal’ and was subjected to being deliberately sidelined by this president and his secretary of state to vomit this out. One would expect an electorate who cared about their country to insist on it. The pathetic part in all of this is that what congress does really doesn’t matter too much. Thanks to the Corker Bill, the senate abrogated its constitutional power to vet treaties in this case. And our Dear Leader happily took advantage of this folly to take this to the UN, where the Security Council approved it . The Europeans and the Russians are already falling all over themselves to do deals and sell advanced weaponry to Iran…even to the point of acceding to allowing the Iranian Revolutionary Guards Corps and the Quds Forceto operate on EU soil starting in 2023, and delisting Iranian banks like Ansar and Mehr whom were under sanctions for material support for terrorism and for transactions involving illegal nuclear proliferation. Iran has already put in place a framework for jihad in the Muslim parts of the Balkans. Whether they’ll bother waiting 8 years to utilize it fully is anyone’s guess. This is another clear signal to Europe’s Jews that they are no longer safe in Europe. Well said, but I would add one thing. This time, the Jews are armed. Laura Rambeau Lee, Right Reason: Congress will reject the deal, the President will veto Congress, and Congress will not have the votes to overturn the President’s veto. So unfortunately, yes, the deal will pass, opening the world to nuclear proliferation on a massive scale. Puma By Design: Will The Iran Deal Pass Congress? You betcha! John Boehner has already ceded power to Mitch McConnell who is only too willing to cede authority to Barack Obama and in turn, Obama will cede, or attempt to cede our sovereignty over to the third-world dictators at the United Nations. So here, we go with the dog and pony show, i.e., hearings, press conferences, tough talking rhetoric, Sunday morning television, etc. However, in the end, Obama’s lapdogs, Boehner and McConnell will do their fair share to add one more chapter to Barack Obama’s legacy. I would love to be able to answer this question with a resounding “No”! But I fear in my heart that it will squeak through and pass. Partly because under the law Congress passed to ensure its review of any Iran deal, unless the Democrats abandon the president wholesale, this deal will stick. The 60-day review period begins once all of the paperwork gets submitted to Congress, per a statement from Sen. Bob Corker (R-TN) That delay would be extended to 12 days if the House and Senate send a joint resolution to the president, and Congress would have 10 more days after that to consider an override. Opponents of the deal have to be able to override a veto on a disapproval resolution to stop it from going into effect. That’s a tall order, with 291 House votes and 67 in the Senate needed to assure an override. 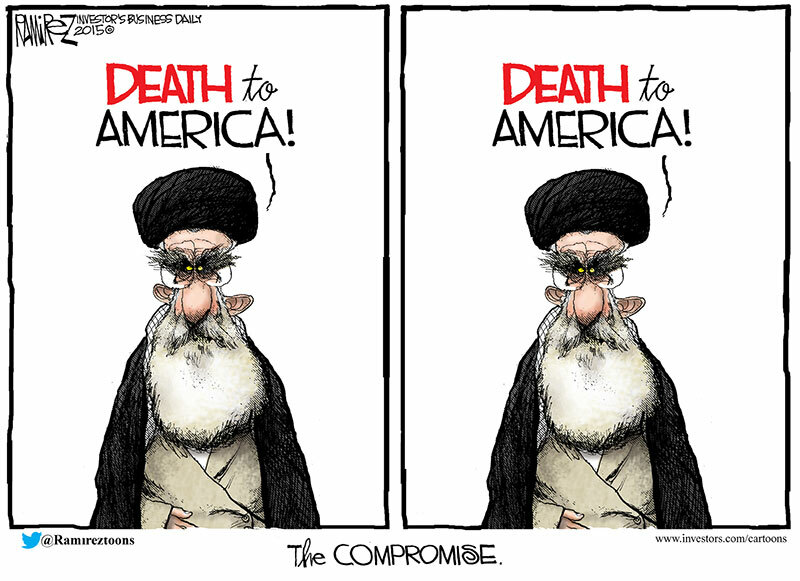 In many ways, the deal seems to be about the sanctions, not the bomb! CSMonitor: The Obama administration, by relaxing the tough sanctions on the Persian regime, is basically declaring peace with the Iranians. For the Israelis and the Saudis, who are fighting proxy wars on several different fronts throughout the Mideast against Iran, this is tantamount to a mass betrayal. We are avoiding war but our allies can’t. The sanctions have hurt the Iranian people. They have stunted the growth of their economy. They made it more difficult for the Iranian armed forces to get cash to buy conventional weapons. They delegitimized the government in the eyes of the people. In other words, the sanctions worked as a weapon in this shadow war between the Jews, the Sunni, and the Shia. The problem for the Obama administration is that the sanctions only worked as long as there was a grand coalition that was that was willing to enforce it… And that coalition was fraying. Sanctions are hard to enforce over the long term because the free market is hard to control. People want to do business. Iran has a lot of oil, which is attractive to the Europeans so this deal is the administration was there way to back out. But then that brings us right back to what this whole ordeal was supposed to be about… What about a nuclear Iran? This what happens when to you send kindergartners in to do a President and a Secretary of States’ jobs. Make sure to tune in every Monday for the Watcher’s Forum. And remember, every Wednesday, the Council has its weekly contest with the members nominating two posts each, one written by themselves and one written by someone from outside the group for consideration by the whole Council. The votes are cast by the Council and the results are posted on Friday morning. It’s a weekly magazine of some of the best stuff written in the blogosphere and you won’t want to miss it.